I am so glad I limited my goals for gift-knitting this year! 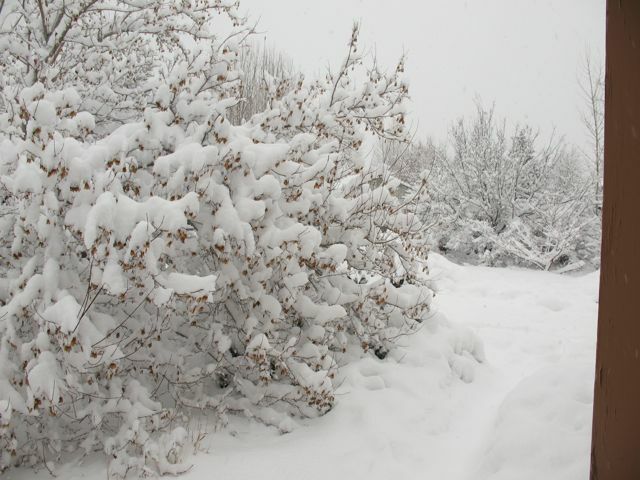 Come Monday before Christmas (12/21) I was done and could turn my attention elsewhere, and not miss the “holi” of the holi-day; could take some time to decompress. I didn’t try to make something for everyone, but did make some nice things for a few close friends and extended-family members. The ribbed hat was VERY much appreciated; the neck-scarf and mitts I haven’t heard back about yet, but I hope to. 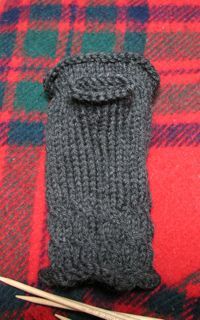 I took some photos of “the thumb trick” on the second mitt, to show you. Right mitt has thumb. 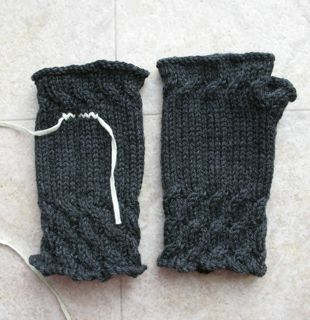 Left mitt has scrap yarn knitted in, where the thumb will now go. Scrap yarn picked out and freed stitches picked up with dpns. I'll knit around the hole with new yarn. 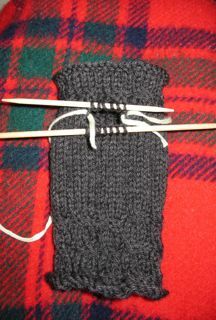 Thumb is knit for 4 rounds and bound off (in purl, to reduce curling). 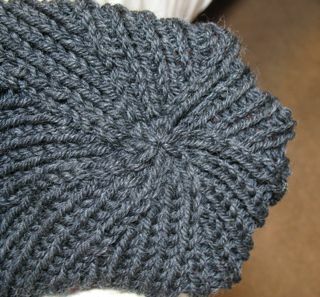 Yarn is Debbie Bliss “Merino Aran” in charcoal. Needles are Brittany Birch double-points in US size 6 (4 mm). These are smaller needles than one would usually use with an aran-weight yarn; the purpose for that choice is to achieve a firmer fabric than you’d want in a sweater. Pattern is “Fetching” from summer 2006 issue of Knitty. This knitter also *received* craft-related gifts that I thought you might like to see. 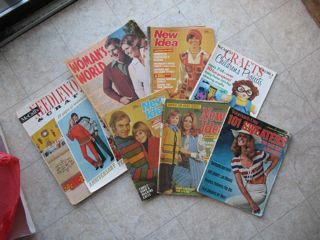 My sister-in-law sent me these magazines that her knitter-mother had saved from the seventies, some originating in New Zealand. Her idea was that, since some of these styles have come back into fashion, I might be able to glean some ideas for new patterns from the old patterns within these pages. Interesting, eh? I’ll have to spend some time looking through them and letting my imagination work. What do they make YOU think of? I’m making a change to this iconic pattern from knitty. I didn’t like how the picot bind-off made the top flare. . . I also redid the BO on the thumb (after this photo), and am about halfway through knitting the second — about 3 rounds until thumb trick! That kinda sums up my recent efforts. Once I’d finished my submission for Cast On, I put my attention on knitting some gifts for friends and family. I’d already finished the Icelandic neck scarf (remember the ruffle-edged pink and purple lace number? 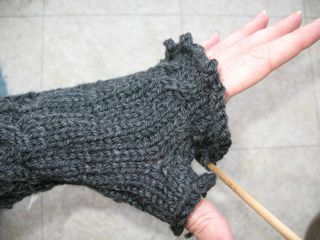 ), but now I wanted to make a ribbed cap and some fingerless mitts. Here’s how things stand today. 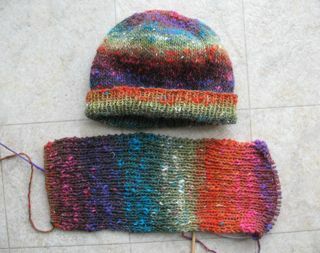 Improvised, bottom-up, 1×1 ribbing, 84 stitches, in Debbie Bliss “Merino Aran” on US 8 (5 mm) needles. 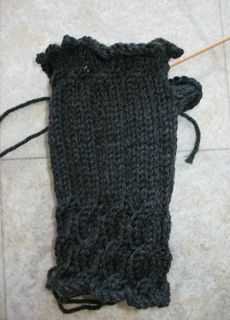 And the mitts are progressing. Same yarn (I have quite a bit left still), but on US 6 (4 mm) needles, to get a firmer fabric. Pattern is “Fetching”, by Cheryl Niamath, published in knitty.com’s Summer 2006 issue (link to pattern) . 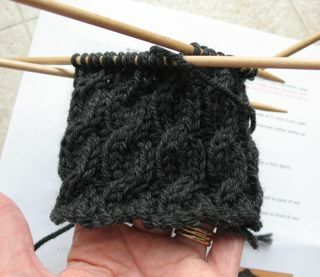 This charcoal color is the closest I want to get to knitting with black (both recipients like black), but I like the yarn’s texture. I posted my proposal to Cast On in time for the submission-deadline this past week, but probably won’t hear whether they’ve accepted all or part of it until the middle of this coming week. I’ve been working on my prototype, checking out necklines, gauges, and increase rates, but I figure there’s limited value in working too far on it, in case they select a different yarn or size (or designer). . . , so I wouldn’t want to go all the way down to the underarms at this point. . . (would I?). . . . In the meantime, I’ve worked on some gift items that might get pushed aside once I hear back from the magazine. I re-blocked the lace edging on that wonderful neck-scarf I made in the Schoolhouse Press Knitalong back in October (pink and purple Kidsilk Haze — yumm! ), to get back the scalloping that my first blocking had straightened. 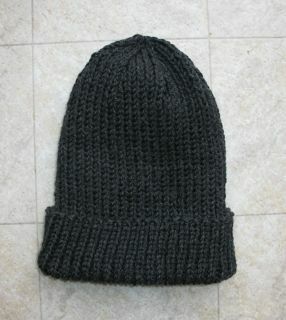 And I made good progress on a ribbed cap for a former pastor. It’s a bit more than 7″ tall now, so any more straight knitting will make for the turn-up brim, and then I should move on to the decreases-in-pattern. I’ve set it aside for today, to take a break, but I hope to finish it before the committee writes to me and knitting time becomes more hectic. 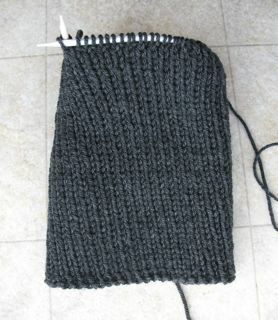 The yarn is Debbie Bliss “Merino Aran” in charcoal, 1×1 rib, on US 8 (5 mm). I’m in no particular hurry to finish up this hat/scarf set in Noro Silver Thaw (50% wool, 25% angora, 25% nylon, color #5, hat on US 8, scarf looser on US 9). My plan is to donate it to a charitable craft sale run by the gal who taught me to knit, and that won’t happen again until *next* November. I’m nearly through the first skein, but have an entire second skein after that! I can just enjoy the knitting at whatever pace fits in between other, more “urgent” projects. I’m not *especially* fond of the yarn — I like Silk Garden better — but the set is turning out pretty well. I consider this part of my series of projects using lots of different types of slow-color-change yarns, including Noro as well as other brands. I have even worked another set of “Korean” (according to Kaffe Fassett in his KF’s Pattern Library book) stripes on my Fair Isle Sampler Scarf. It has been snoozing for quite some time, but I pulled it out again today for some restful, non-panicky knitting. There is something about this project that I find so soothing! 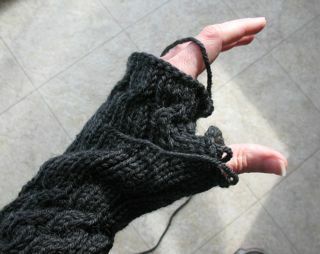 My last post had videos about how to do Jeny’s Surprisingly Stretchy Bind-off and Jeny’s Stretchy Slipknot Cast-on. 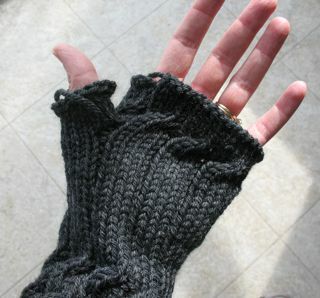 I told you then that I’d tried the bind off, but not the cast-on. Well, now I’ve tried both, and here are my results and comments. 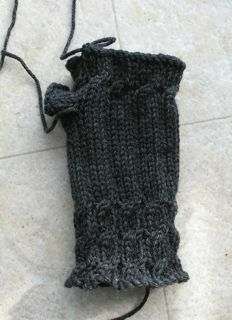 This is a LARGE close-up view of Jeny’s Surprisingly Stretchy Bind-Off (JSSBO). See the double row of horizontal bars? 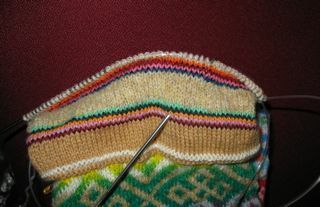 The top row/round has the usual teardrop shaped stitches when viewed from the top. The loops underneath are the extra YO’s you made between every stitch. 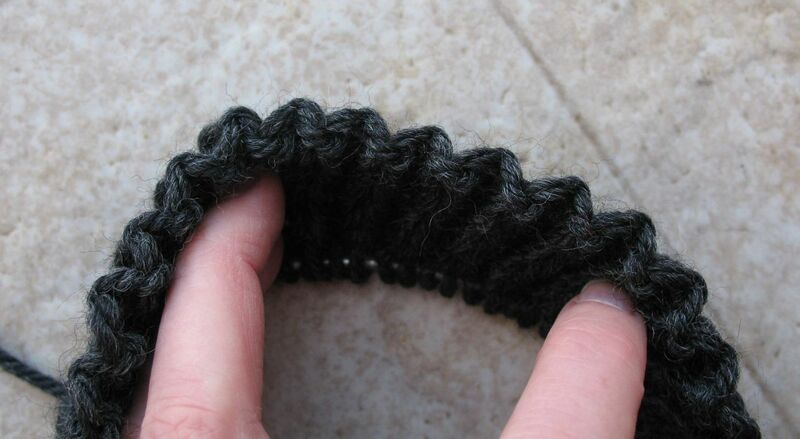 The YO’s end up as horizontal loops around the necks of the last row’s/round’s stitches. 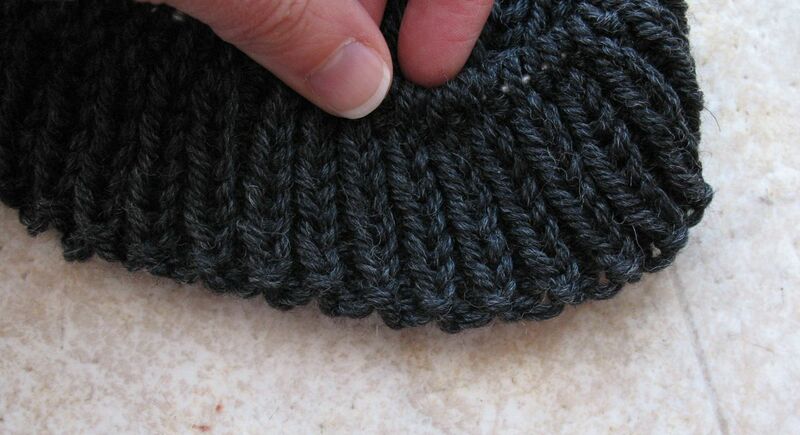 This extra yarn can be drawn upon by the BO stitches to allow extra stretch. This BO also eats up a lot of yarn, as you can see here because I used a variegated yarn: the color blocks get used up doubly quick, about 7 white BO stitches vs 14 white normal stitches in the ribbing. It’s also a bit bulkier than the surrounding knitting. Not too hard to do, though, and goes pretty smoothly. And here is the Slipknot Cast-On (JSSCO). 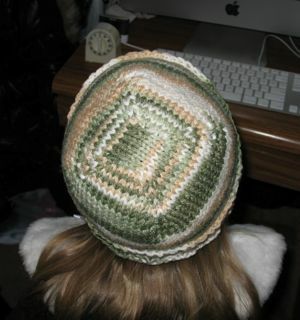 Both the BO and CO remind me of the Twisted German CO, with the extra loop around the base of each stitch. 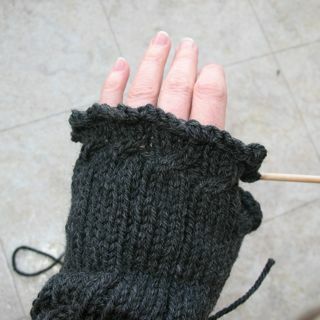 But these do follow the bends of ribbing very well. The trouble I had with this cast-on was that the yarn (non-superwash merino) didn’t want to pull through the slipknot smoothly, but kept sticking and knotting up prematurely. When this happened, I had to undo that knot and re-cast-on that stitch. 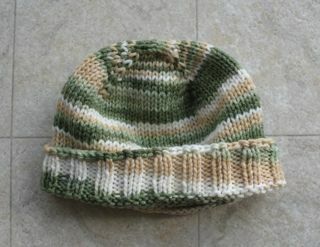 Not even/uniform enough for Master Knitter work, but good on a hat. I think I’ll try Twisted German CO (also called Old Norwegian, and some use the same names for slightly different cast-ons) again soon, and compare them for stretch. Here are some more “normal” shots of the green and tan cap I just completed.